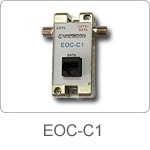 EOC(10Mbps Ethernet over Coax) Series is designed to deliver 10Mbps Ethernet Data co-existed with CATV signal. With features of passive, full duplex, and high band isolation (~80dB) to prevent interference, the 10Mbps Ethernet over Coax solutions have been widely used internationally such as five-star hotel, local homes networking, and some old coax networks which need Ethernet data input. • Using reverse band (0~42MHz or 0~65MHz optional).